Advances in manufacturing have improved laminate flooring and rendered it an ideal choice for any homeowner interested in stylish and durably flooring. Our well-stocked flooring store carries the latest laminate styles, and offers customers an impressive selection of products from the industry’s leading brands. 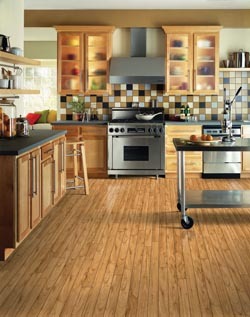 The flooring professionals we employ provide exceptional service in the store and at your home. Our knowledgeable store associates help homeowners choose the ideal product that satisfies in performance, appearance, and price. Following any purchase, our experienced technicians carry out long-lasting, meticulous installation services. When it comes to your laminate floor installation, you can rest easy knowing that your satisfaction is our main concern. Should you decide you are unhappy with the new laminate within 30 days of the install, we promise to replace it with a similar product for free. This unique promise is referred to as our Ultimate Confidence Guarantee. If you are ready to replace old and outdated floors, don’t hesitate to set up an in-home consultation with our flooring experts. Our technicians will come to your home for free to perform room measurements and fully inform you about our installation process. Set up your free consultation by contacting us today. Our technicians would be more than happy to discuss the benefits of laminate flooring with you. We proudly serve clients in Hooksett, Manchester, Goffstown, Bow, and Bedford, NH, plus all of the surrounding areas.